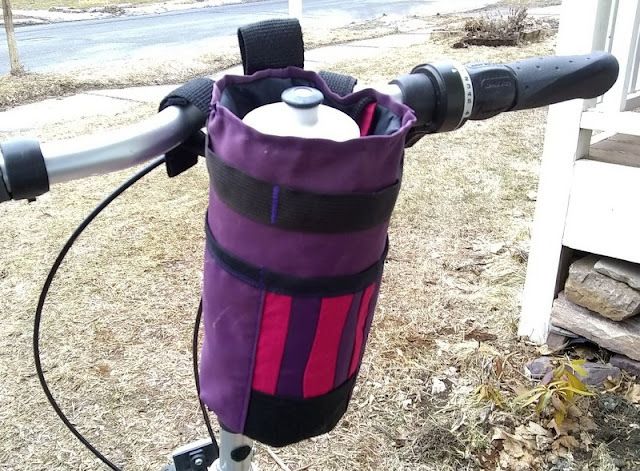 The new and improved water bottle carrier for the Dahon. After last year's easy remedy to add water carrying capacity to the Dahon, which worked well for a while, but then the fabric and lining lost it's structure as heat and humidity and the hottest summer on record took its toll. It was frustrating to remove and replace a sweating bottle so I vowed to come up with a long term solution. Prerequisites: constructed with reused material, use Velcro-like loop and fasteners for versatility, hold small or large water bottles or a bottle purchased at a convenience store, and enough stiffness to not collapse like the previous version. 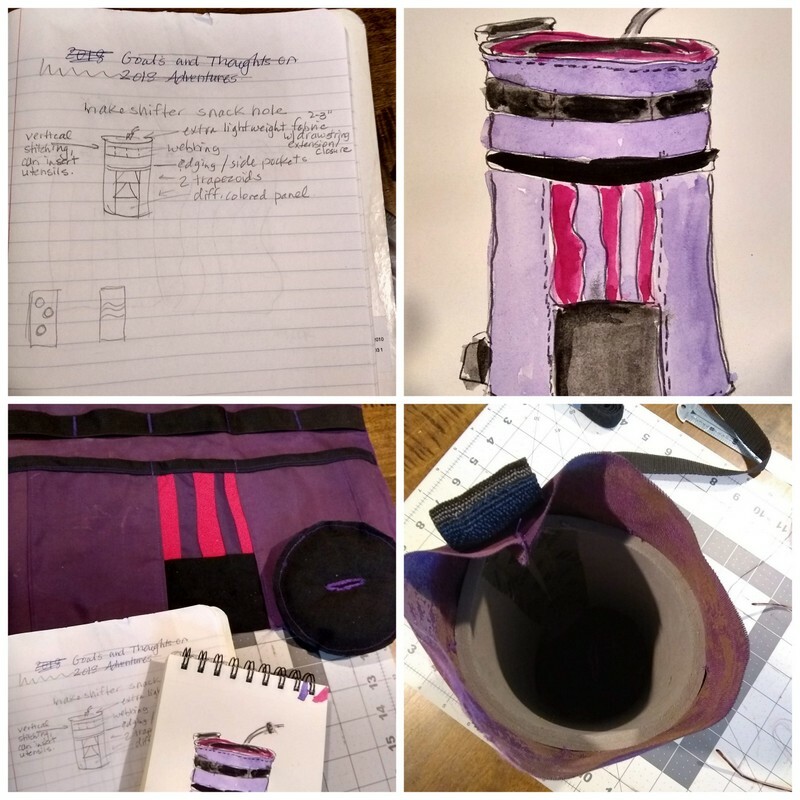 I thrive on re-purposing bags, problem solving, and construction and if it has something to do with bikes, well, this project was right up my alley! 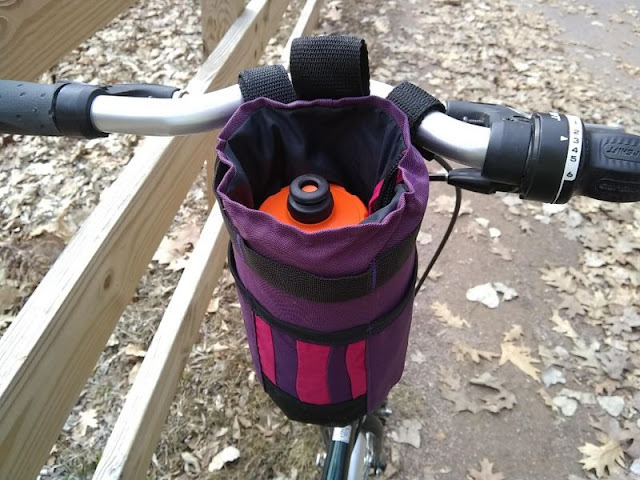 Once I discovered Makeshifter's Snackhole Stem Bag, I knew that was the design I would copy, but add my own personality and retrofits for a folding bike's handlebars. To begin, I made notes, sketches, and started painting with watercolors - primarily to add painting back in my life, even if they are tiny images. It also helped to conceptualize the color scheme, not that you can go wrong with hot pink, purple, and black! 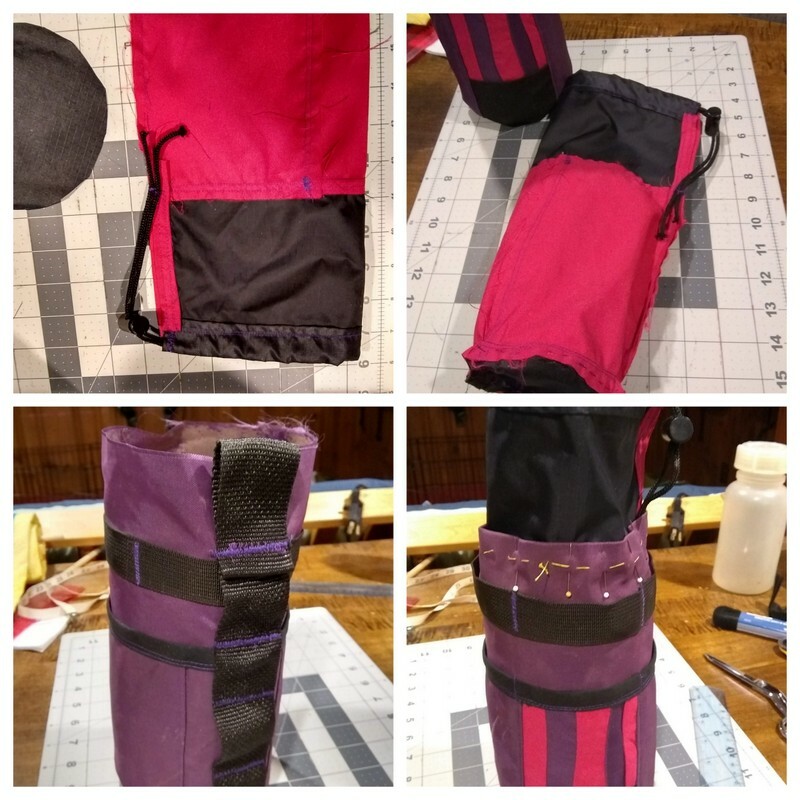 The structure is a piece of 1/4" closed cell foam (saved from who knows what and when), formed into a cylinder (above photo, lower right picture), sewn, then duct-taped because I wasn't convinced hand-stitching would hold both ends together. Each project session was 1-2 hours on six successive weekends, mainly because of my shorter attention span, inadequate basement lighting (location of sewing corner), and early darkness in winter. And if truth be told, there were so many steps involved - most I made up as I went along - that I needed head space to work out ideas. The process reminded me of wrenching on my own bikes, running into roadblocks, and having to walk away and return with a fresh outlook. I took apart an old purple backpack, saved buckles and straps (I now have probably too large a collection!) and washed all fabric pieces. The pack had a removable top pouch/flap that is also versatile, which I've used a bit on the Dahon's bars... but that's another exciting upgrade project for the future! 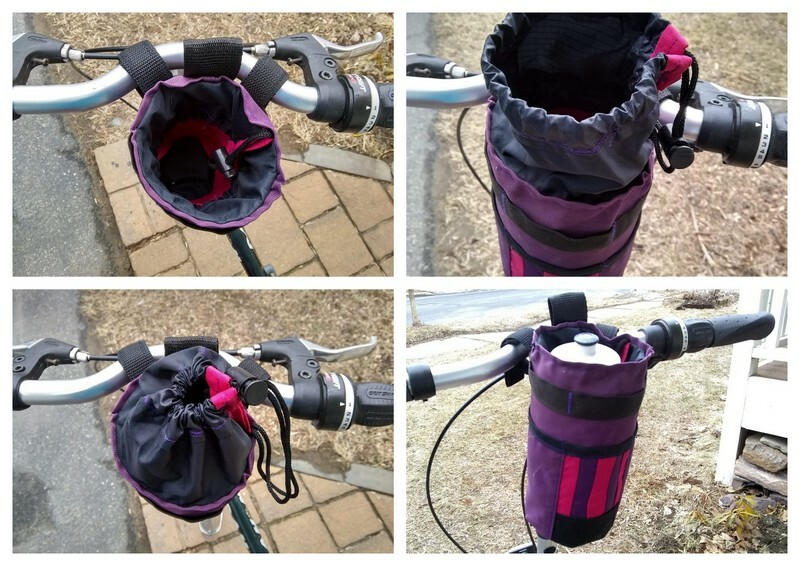 The Snackhole's features held appeal: an exterior pocket for pens, utensils, etc. 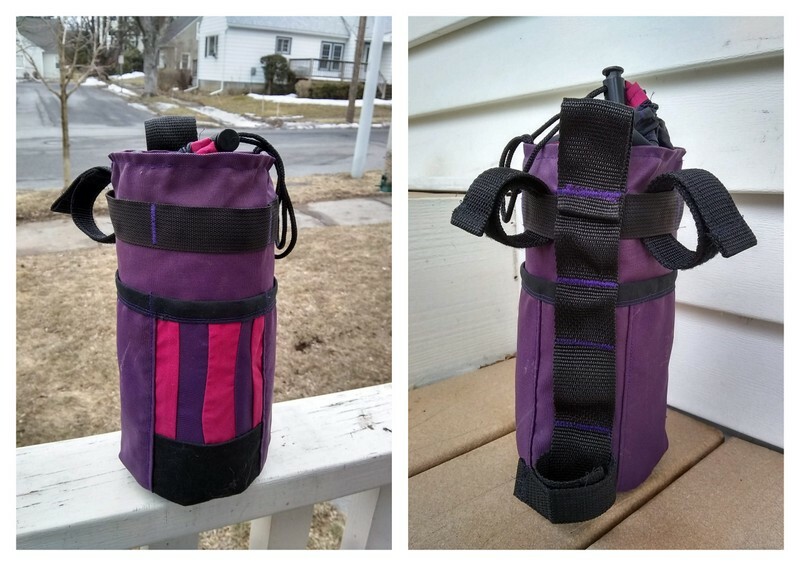 plus a horizontal strap to secure/clip keys, knife, or what have you - a versatile array of possible uses in addition to holding a water bottle. I set out constructing the exterior piece first, and for decoration, tried my hand at piecing curved stripes, but it marginally worked, instead stripes look like badly sewn straight pieces, but I'm fine with roughness. The purple cordura material is slightly faded anyway, which seems to fit the overall look. I'm not expecting perfection, at least on this part. I then sewed the pocket section to the larger exterior, then placed and sewed the horizontal strap, tacking it with purple stitching. It was fun to use lots of contrasting thread colors. I sandwiched the circular bottom pieces between foamy packing material, then added a button hole for drainage (Snackhole has a grommet), which looks nice and in theory should function well, but later I add the lining without a hole as it proved too difficult to align lining with exterior. I'm fine with the way it turned out. Left photo compares old and new sizes. Right photo shows puckering on first sewing. Fashioning the lining proved more difficult, and after sewing it to the exterior, the completed horizontal edge puckered more that I could stand (above photo, right image). The lining was too narrow at the top portion, where I'd unfortunately sewn the exposed, expansion material because I thought the raw edge would show. As it turns out, I used contrasting pink material to cover up edges (see photos below) anyway, so no need to finish off the raw edge. Unhappy with the result, I painstakingly ripped all the seams to reconstruct the lining, then resewed everything. The finished top edge is much better - not perfect - though something I can live with. 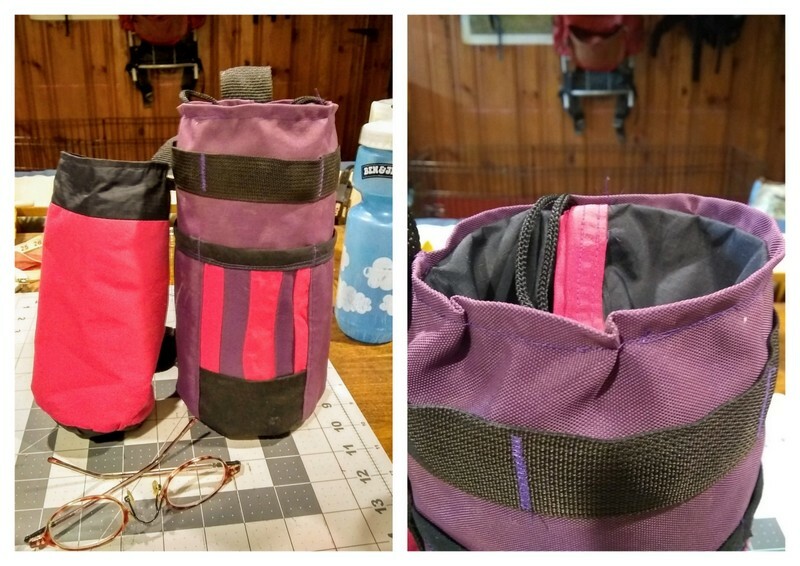 I have a bag that's stylish, versatile, and unique that can hold bottles of water and other sundries, suitable for a bike plus do double-duty as extra space attached to a backpack. It is deeper than the Snackhole, plus has a variety of attachment points. I'm very pleased with the finished product. This was a challenging project, and perhaps the most difficult project I've ever tackled, mainly because I tried to copy someone else's design, while adding my own features, all while configuring material to wrap around a set piece of closed cell foam. Figuring out each step complicated the process: when to sew straps, pockets, and lining to easily fit each section into the sewing machine. I have tremendous respect for Becky at Makeshifter for her unique designs (she has many) and her construction method, I imagine, developed after many iterations. Do check out her website. I normally avoid bike-specific garments, but shoes are another thing altogether. 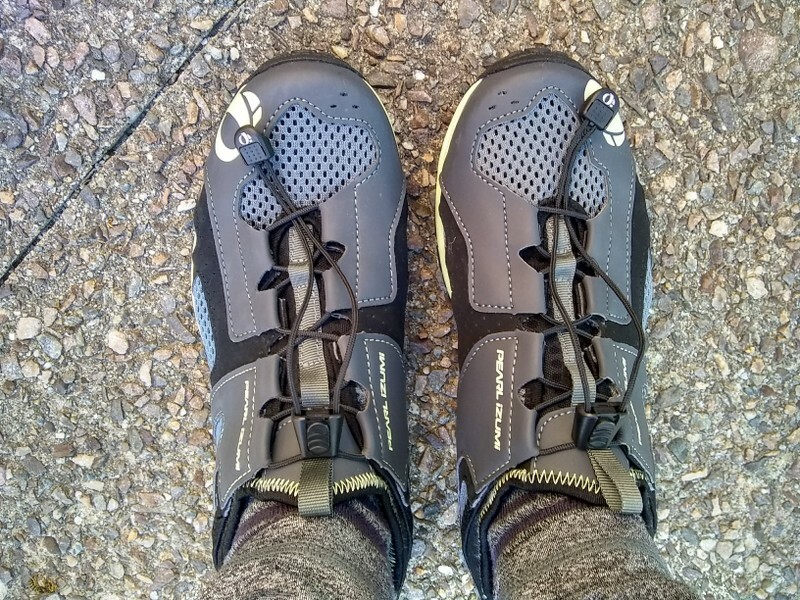 I dearly love my Nashbar Ragster sandals and because this second pair is new I wasn't necessarily looking for another pair of bike shoes, but sometimes I can't resist deeply discounted footwear. I came across a pair of Pearl Izumi ladies' shoes, only available in one size - my size - for less than 20.00. Surely, that's a sign! Previous to bike sandals, I used Shimano shoes until they showed wear and gradually were too tight - about the time when my feet grew one size. I've missed owning a more formal shoe, something that could be used for longer rides. Fortunately, as with the sandals, I can avoid cutting out the rubber-coated bottoms to expose cleat hardware, and wear the shoes as-is on flat pedals, my preferred pedal choice these days. The new shoes are definitely acceptable, especially for the price. They're narrower than I expected and a more lightweight type shoe than the much older, thicker Shimanos. The Pearl Izumis have mesh sides that are airy so thin socks are a must for early spring and late fall rides. The cord-lock enclosures take some getting used to. The laces gradually loosen over time. However, the neoprene sock-like collar is comfortable and prevents the shoe from coming off. The sole is made from a harder material than my sandals, so I'm careful to avoid sliding on my RMS sneaker pedals. Even with the caveats, I'm pleased to have another pair of stiff-soled footwear, a nice backup to the sandals that I usually wear 6 months of the year. 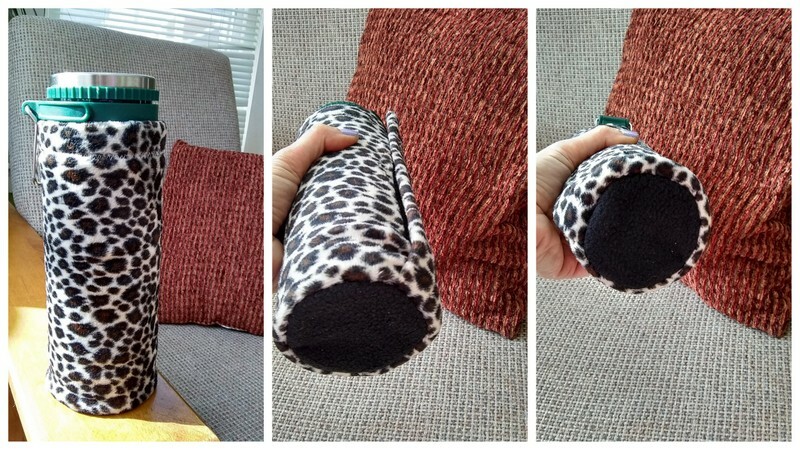 Leopard Print Thermos Koozie - Love the Fuzz! For ten years I've been a huge fan of leopard print fabric. I came across a large piece sewn and backed to black fleece - enough to nearly wrap into a skirt - at Goodwill. I had visions of creating an insulated, stylish winter skirt or leg warmers, but fortunately I didn't have enough material or know-how to create either, nor did I think in the long run I would necessarily use them for a long period, so I gave up on both ideas. I've decided to use the fabric for small, more practical projects like a koozie for my Stanley thermos. As with most Stanley products, they're well made and their thermos is no exception. When used the exterior metal is very cold to the touch, even with gloves. It seemed ironic that on winter days I grasped a cold thermos to sip hot liquid! The construction was simple. With both fabrics (leopard print is more like velour with a nap than fleece) I wrapped around the cylindrical shape with enough overlap for a strip of black Velcro, sewed the edge, then the fastener. I hand-stitched the circular bottom two pieces to keep them from shifting, then machine stitched the circle to the cylinder. The finished koozie is snug, stylish, washable, and - most importantly - keeps my hands warm! Frankenbike - An Antiquated or Appropriate Term? My initial understanding of a FrankenBike: an oddly, unique bicycle. Image found on Twitter. The term FrankenBike has always bothered me, but as I've discovered, it's more the name itself than the actual process: as defined by the Urban Dictionary "a bike built up from various components scrounged from different sources (friends, swap meets, craigslist, etc.)." My first impression was a bike that was instantly recognized (pictured above), unique in frame style certainly, but functional. Possibly a bike to be used at special events, for short distances. 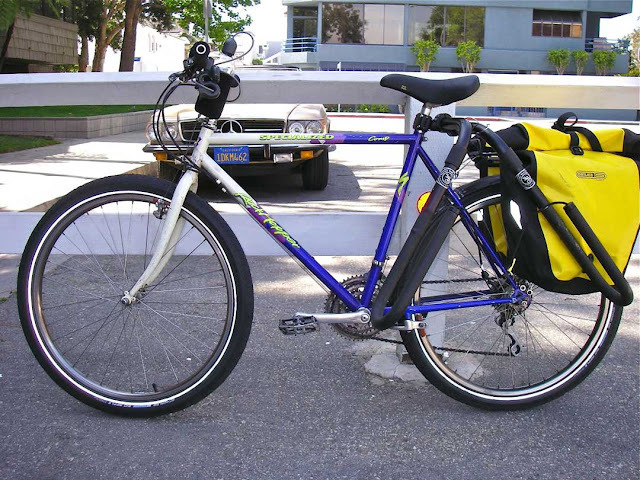 A typical commuter Frankenbike. Photo credit: The making of a Frankenbike. But then I started seeing various bicycles called Frankenbikes, and many styles that resembled typical commuter bikes. I became confused. Was a Frankenbike a broad term for any bike cobbled together from various parts? Apparently the term is fairly liberal. I wouldn't classify the good work that Beth does, rescuing frames and making serviceable bikes for new Americans, or the cool Randy creations as Frankenbikes, because in reality, I think the term has strayed from it's origins. But then again, beauty, functionality, and exacting descriptions in this day and age of plentiful, diverse new and used components remain in the eye of the beholder. What I do know is I'd love to attend a FrankenBike swap meet! What do you think about Frankenbikes? Does the terminology bother you? 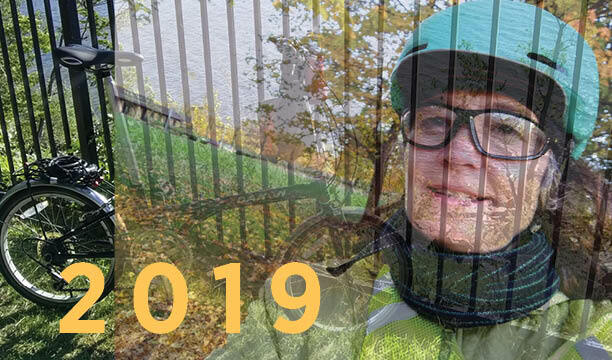 Ideas for 2019 and Beyond? 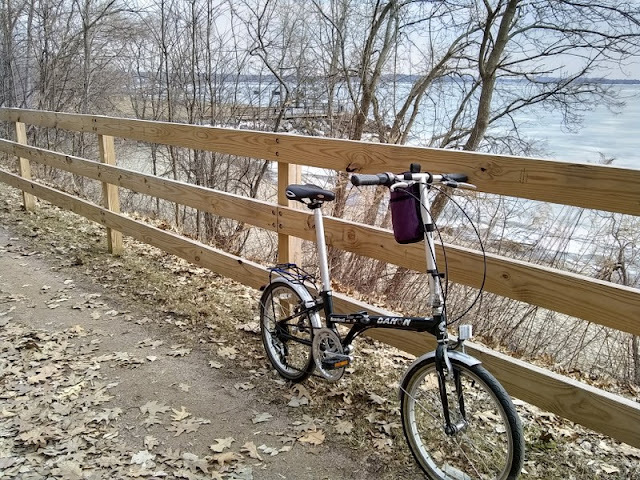 Inspired by last year's New York City adventure, I had a general idea to visit family in southern Connecticut, then board a ferry with the Dahon to explore Greenport and Montauk regions on the tip of Long Island. As I age, coastal communities - and of course sandy beaches - are appealing to me. I'm also interested in attending the Philly Bike Expo and riding Philadelphia area trails. (Thank you MG for the ideas!) It would be my first attendance at a bike-related trade show plus an inaugural visit to Philadelphia, easily reached via Amtrak. I'm hoping a son or two might enjoy a long train excursion and weekend with mom. But then my husband suggested a European hiking adventure, the Tour de Mont Blanc, which is too good to pass up! I picture rebonding with my husband on this famed, picturesque journey, a region we passed through during our 1990s around the world trip, then revisited 5 years later for day hikes near Chamonix. Though the 100+ mile circuit would eat up my meager two weeks vacation, now that our children are self sufficient, and if the logistics work out, that's where I'm headed this summer. The Long Island foray make take a backseat, but I'm still considering the Philly Bike Expo vacation. And if not, either outing can be revisited another time. Plus, always at the back of my mind is to attend bike school in Colorado - some day! On the home front, I have visions of overnights 10-20 miles from home, plus an annual weekend visiting Canadian trails and back roads. 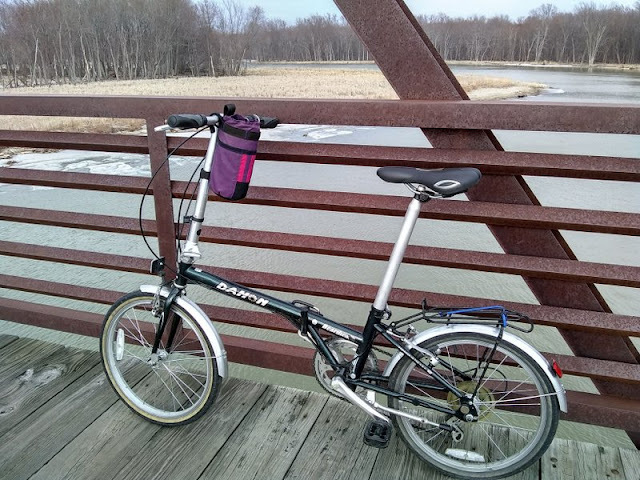 Bike wise, my primary focus this year is on the Dahon. I appreciate it's versatility and it's obvious benefits while traveling by train. Plus, with the right baggage setup the folder can do double-duty as a commuter. Sew/reuse material to create bags for the folder. I have ideas and I recently stripped, cleaned, and cut up an old backpack for this project. Explore how to easily lower the Dahon's gearing (new front chain ring? ), while keeping the 1x set up. Gauging interest in continuing this forum. All posts are solely my musings and should be taken with a GRIN of salt. Simple theme. Theme images by jacomstephens. Powered by Blogger.